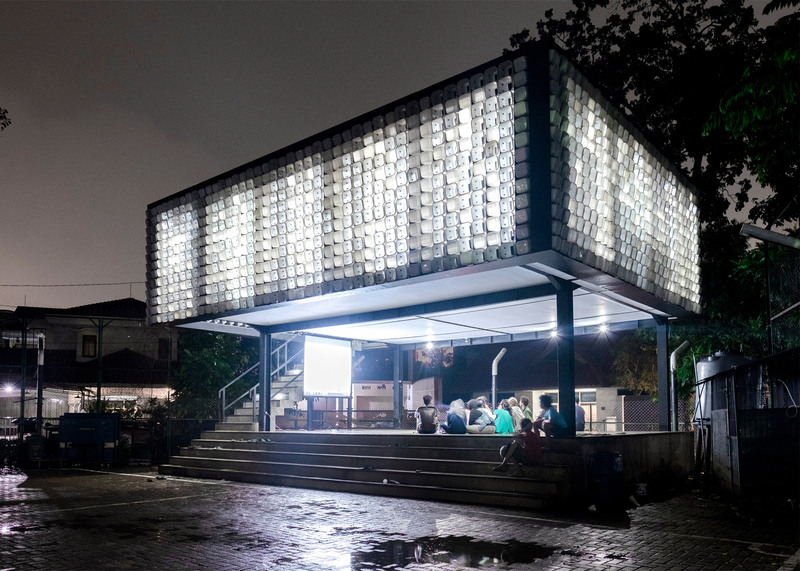 Two thousand ice-cream tubs form the walls of this small community library in Bandung, Indonesia, and some of them have been perforated to display a subtle message (+ slideshow). 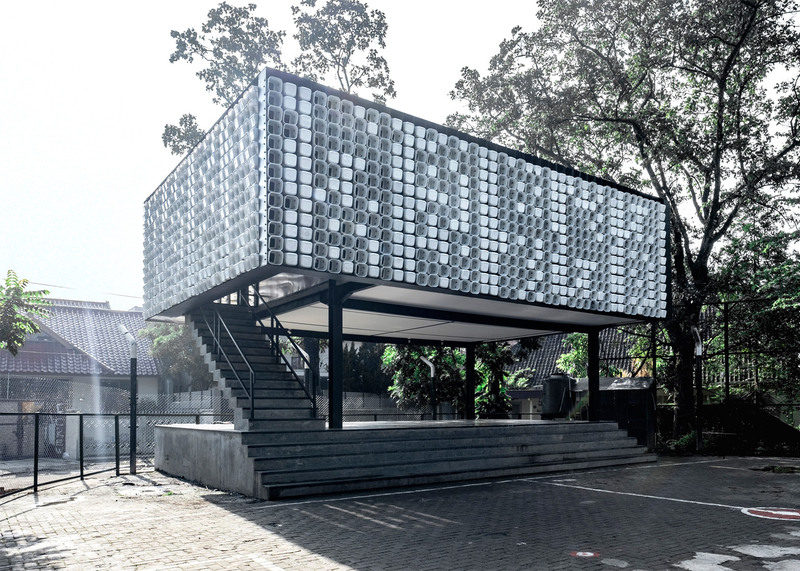 The Microlibrary was designed by the local office of architecture firm Shau as the first prototype for a series of small libraries it intends to build across Indonesia. 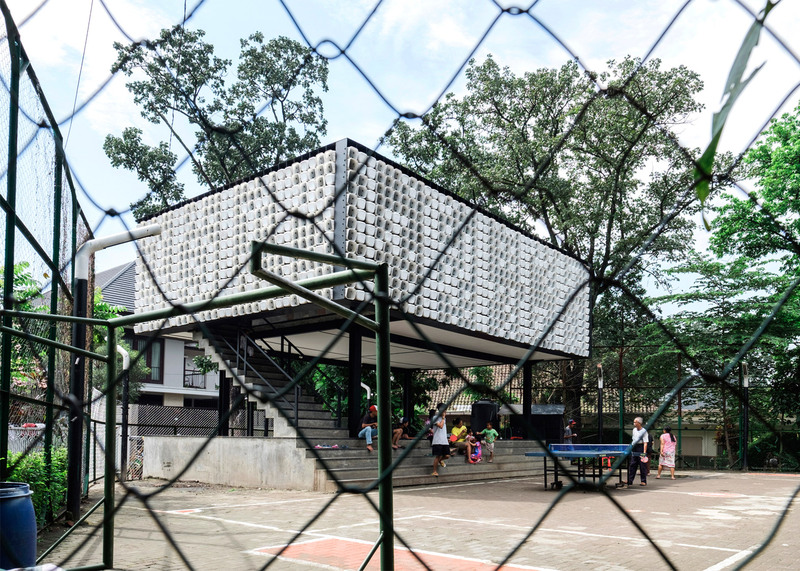 Situated in a small public square in the city's Taman Bima neighbourhood, it provides a space for teaching and other activities aimed at combatting the country's high illiteracy and school dropout rates. 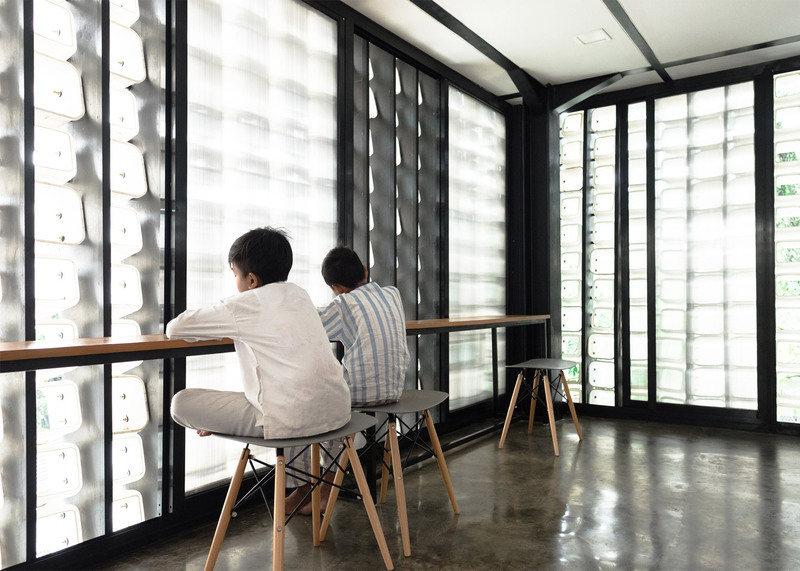 For the facades, the project team tried to find an affordable, locally available material that would provide shade whilst enabling air and natural light to reach the interior. The initial idea was to use white and translucent plastic jerrycans, but these were not available in the quantities required at the time of construction. Used ice-cream tubs provided the eventual solution, as they could be purchased in bulk. An added benefit of the tubs is that they are stable when the bottoms are removed, meaning they can also be used to bring in ventilation. The plastic tubs are fixed to vertical steel ribs and are angled outwards to provide an effective rain screen. 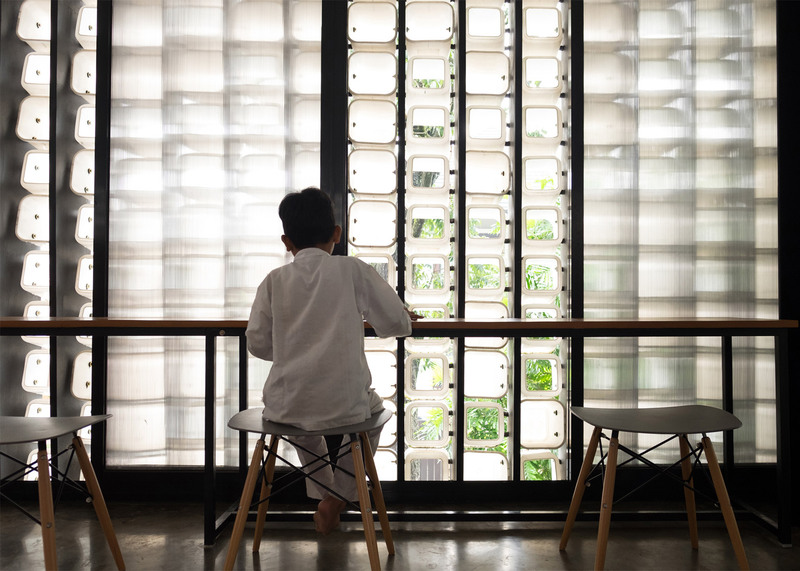 Translucent sliding doors mounted behind the facade can be closed to create a completely impermeable facade during more severe tropical storms. 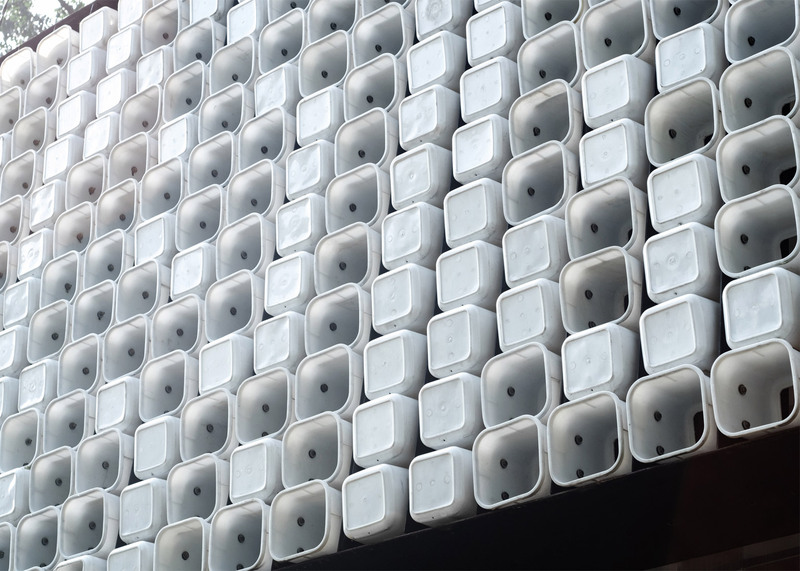 The architects realised when deciding how to arrange the tubs that they could be used to form a pixellated surface of closed or hollow elements. This system was used to depict a message from Bandung's mayor which reads: "buku adalah jendela dunia", meaning "books are the windows to the world". 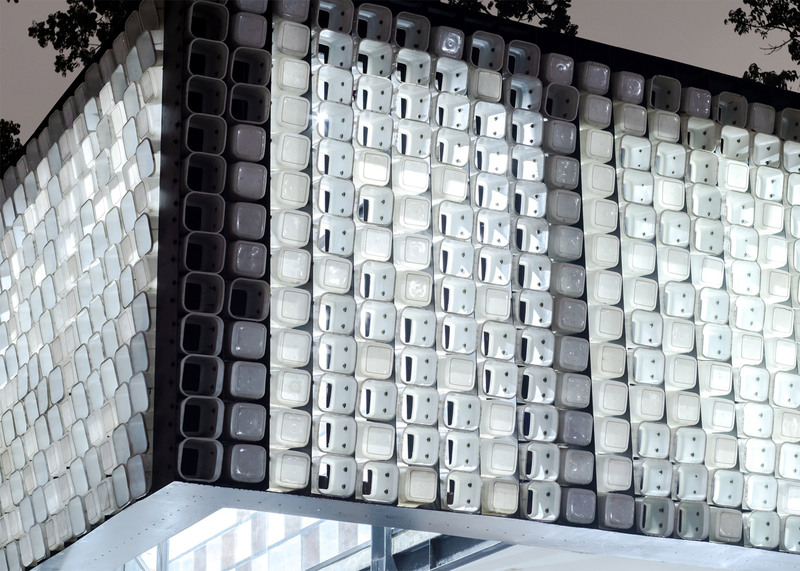 "Not only does the facade give additional meaning to the building, but the buckets also generate a pleasant indoor light ambiance since they scatter direct sunlight and act as natural light bulbs," said Shau. The removal of the bases of roughly half of the buckets was carried out by local craftsmen, who improvised a customised punch to make the process more accurate and efficient. The entire project was completed to a budget of around £30,000. The library is raised off the ground on a simple steel I-beam structure. It is positioned above an old stage used by the local community for events and as a gathering place. The stage was reproduced in concrete and a set of wide stairs was introduced at the front. 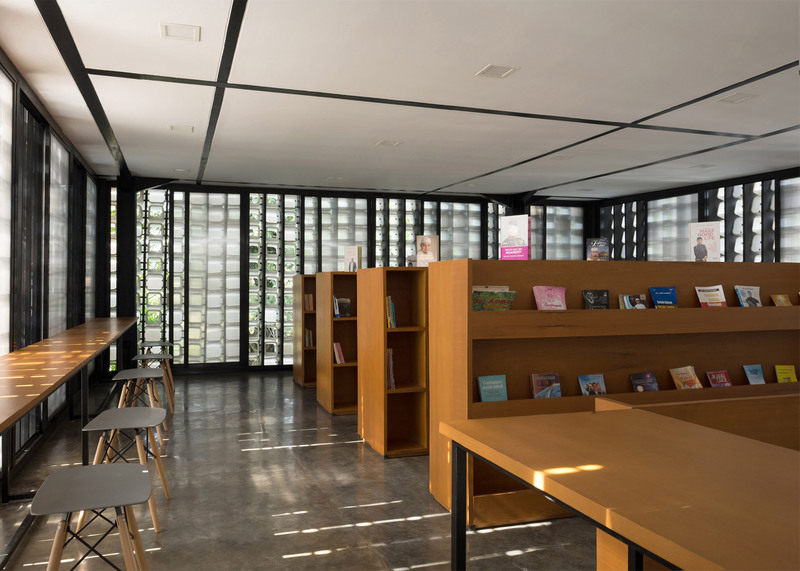 "Our intention was to add rather than take away, so we decided to enhance the open stage by shading it, making it rain protected and covering it in the form of the floating library box," said the architects. The steel framework supports concrete slabs that form the building's floor. The Microlibrary was developed with support from the local council and nonprofit organisation Dompet Dhuafa. 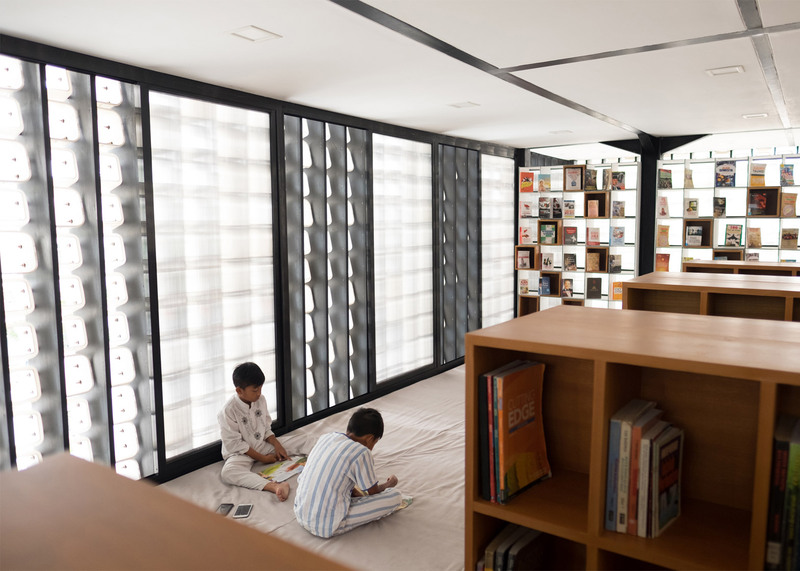 "The Microlibrary adds identity and is a source of pride for all the people in the neighbourhood," added the architects. "Our mission is to rekindle interest in books by offering a dedicated place for reading and learning, availability of books, other media and courses." Other examples of waste being used to create buildings include a university research facility in England clad in old carpet tiles, and a house in India with old doors and windows incorporated into its facades. Photography is by Sanrok Studio.